Our free quarterly Wellburn Post, is a way for us to get involved with the local community, groups and businesses. To show our support and to thank them for theirs. 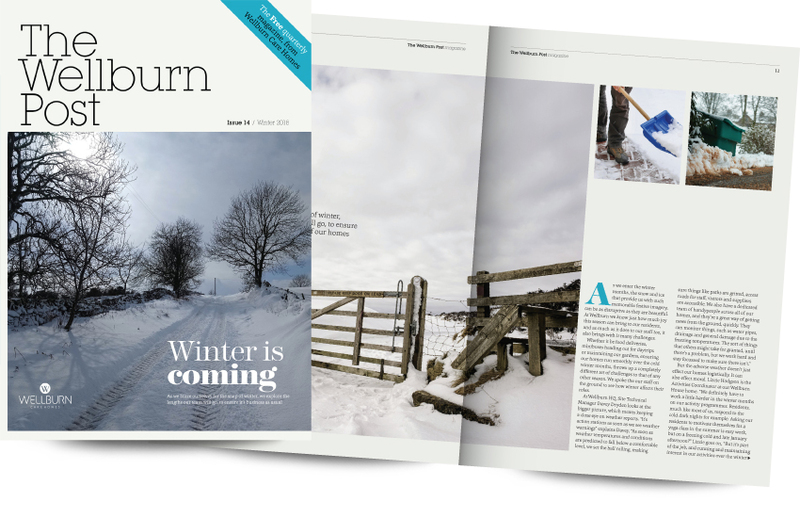 We publish our free Wellburn Post magazine every quarter. Each issue is packed full of news, features, recipes, book reviews and much more. The Post gives our residents and the local community a voice. Hopefully, you’ll already have a copy of the latest issue, but if not, why not join our subscription list and get your free copy hot off the press every time. To subscribe, simply scroll down the page and complete the subscription form below. Further down the page, you can explore all of our previous issues too. If you’d like to subscribe, and make sure you’re one of the first to get your hands on the latest issue, simply complete the subscription form below, and we’ll pop a copy of future issues in the post to you. From time to time we'd like to keep you posted about the Wellburn Post and other exciting things going on at Wellburn Care Homes. If you like to receive these updates please 'Opt In' below. Thank you for subscribing the The Wellburn Post. We'll be popping a copy of the latest issue in the post as soon as we can. In the meantime, explore our website to find out more about our care homes.